Acronis Drive Monitor uses S.M.A.R.T. (Self-Monitoring, Analysis, and Reporting Technology) monitoring technology which is available on the most modern hard drives. 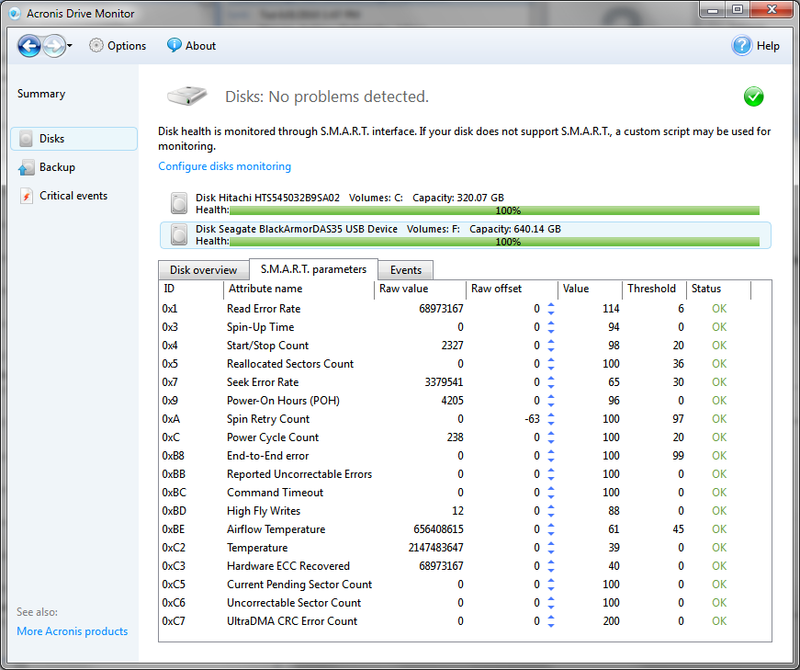 Acronis Drive Monitor analyzes a number of S.M.A.R.T. attributes, and shows them as drive "health" which may be between 100 and 0%. The algorithm of health calculation is detailed in Acronis Drive Monitor: Disk Health Calculation. While it is not uncommon for a drive to develop few defects reported as health degradation over the time, quick health degradation is an alarming sign which may indicate serious defects on the drive manufacturing stage, which is likely to trigger drive failure in the future. Therefore, monitoring of health degradation over the time is more important than reading instant snapshots of the drive health. While historical data on the disk health is not reported by Acronis Drive Monitor, there is an easy way to "restore" the health to the original levels, and then monitor if the further degradation takes place. Normalized value of the parameter is calculated by the drive firmware based on the raw value. Together with the threshold, it is used to check against "threshold exceeded" condition (which happens when the value drops below the threshold). The "threshold exceeded" condition is usually used by the drive firmware to report "failure predicted" status. 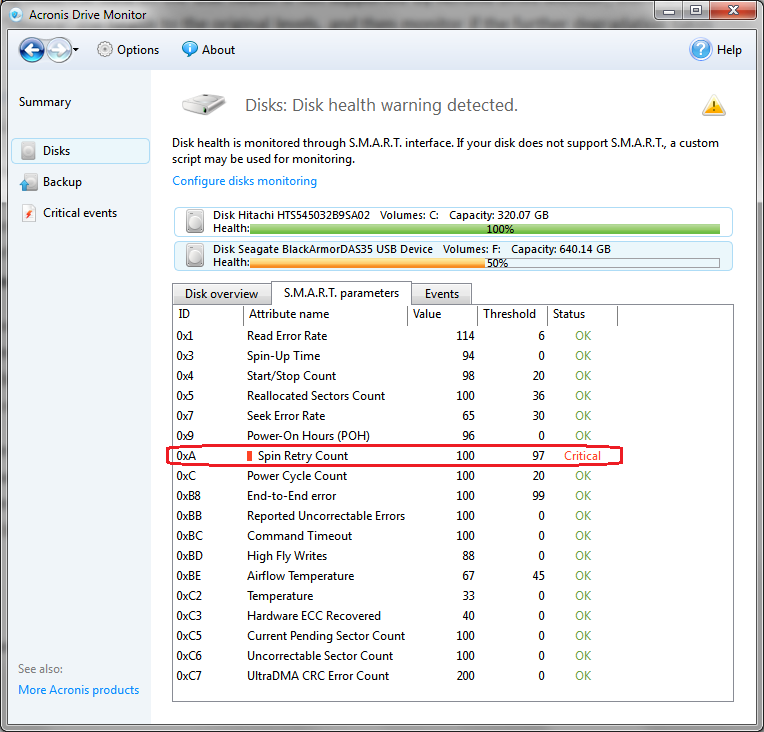 Acronis Drive Monitor uses raw values of several S.M.A.R.T attributes to calculate the drive health. 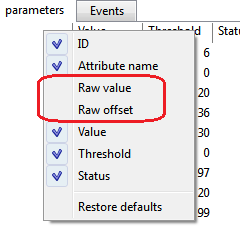 Before the health calculation is performed, an offset is applied to every raw value. Managing the offsets, Acronis Drive Monitor users can reset the raw values back to their original levels, efficiently resetting the drive health back to 100%. If the health drops further, it will be easy to notice as it will decline from the 100% level. If the raw value of the "Spin Retry Count" attribute will decline further, you may immediately notice it as health degradation. Note that the "failure predicted" status cannot be overwritten using raw values offsets (see "Drive failure predicted" Status Reported by Acronis Drive Monitor).